French General Thomas-Alexandre Dumas fighting off the Austrian army, at the bridge of Clausen in Tyrol, on Jan. 17, 1797. 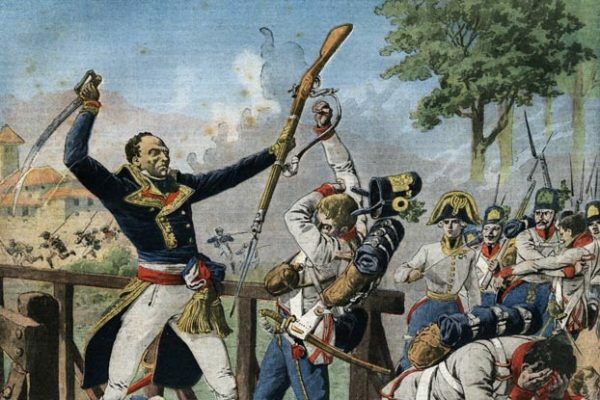 Thomas-Alexandre Davy de la Pailleterie, also known as Alexandre Dumas, was a general in the French army and became one of the highest-ranking Black men of all time in a continental European army. Born in Saint-Domingue (Haiti), Alexandre Dumas was of mixed race, the son of a white French nobleman and an enslaved mother of African descent. In 1776, at age 14, he traveled to France to live with his father, who had left Saint-Domingue the year before. Dumas’s upbringing was typical of a son of an aristocrat, and in 1786, at age 24, he joined the French army as a private. However, his father refused to allow him to use his name in the lowest rank of the army. Thus, he dropped Thomas from his given name and took his mother’s surname, entering the service as Alexandre Dumas. By 1792, Dumas was a lieutenant colonel and married Marie-Louise Labouret. The next year, he was promoted to general of the Army in the western Pyrenees. Eventually, he joined Napoleon Bonaparte in Italy, and later in Egypt, where he questioned Bonaparte’s policies. The break between them was permanent. Denied a decent pension, the general soon died a man broken in spirit. Alexandre Dumas was the son of Alexandre Davy de La Pailleterie and the author of “The Count of Monte Cristo” and “The Three Musketeers.” He’s regarded as one of the most widely read French authors of all time. After General Dumas’ death in 1806, the family fell on hard times, and as a young man Alexandre went to Paris to attempt to make a living as a lawyer. He managed to obtain a post in the household of the Duke d’Orléans, the future King Louis-Philippe, but tried to earn his fortune in the theater. Dumas’ plays were well received in the late 1820s and early 1830s. Although he continued to write plays, Dumas next turned his attention to the historical novel, eventually writing the books mentioned above and what he is best known for. Alexander Sergeyevich Pushkin is considered by many to be the greatest Russian poet and the founder of modern Russian literature. Pushkin was born into Russian nobility in Moscow after his great-grandfather on his mother’s side, Abram Petrovitch Ganibal, was enslaved and brought over from Africa to Russia, where he rose to become an aristocrat. Pushkin’s historical fiction “The Blackamoor of Peter the Great” is based on his great-grandfather. Read “The Collected Stories (Everyman’s Library)” of Alexander Pushkin. Joseph Boulogne, also known as Le Chevalier de Saint-George and the “Black Mozart,” was an African who rose to the top of French society because of his mastery of European music and sword-fighting. He was the son of an enslaved African woman, Nanon, widely considered the most beautiful woman on the island of Guadeloupe, and a father who was a member of a wealthy family from the French Caribbean colony of Guadeloupe. Saint-George excelled at many disciplines in his lifetime. He became an elite musketeer of the King’s horse guard; a master-swordsman and Europe’s fencing champion; a composer, violin impresario, and opera director that influenced Mozart, and a military hero in the French Revolution — ironically all in an age when slavery was endemic and white superiority was dogma. Queen Charlotte, wife of the English King George III (1738-1820), was directly descended from Margarita de Castro y Sousa, a noblewoman from the Black branch of the Portuguese royal house. Her personal physician described her in his autobiography as having “a true mulatto face.” The city of Charlotte, North Carolina, is named after her. Portraits of Queen Charlotte were often rejected by the royal couple, who were not happy with the representations of the likeness of the queen, whose African ancestry was to be hidden. Sir Allan Ramsay was the artist responsible for the majority of the paintings of the queen, and his representations of her were the most decidedly African of all her portraits. Alessandro de’ Medici was the Duke of Penne and Duke of Florence in the early 16th century. He is regarded as the first Black head of state in modern Western history. Historians believe he was born to a servant of African descent who was working in the Medici household. Alessandro was made hereditary Duke of Florence in early 1532 and “became the head of one of the most illustrious families in European history — a family that furnished a long roll of statesmen and patrons of art, as well as three popes, three kings of France, three queens and a mother of one of England’s kings.” His cousin, Lorenzino de’ Medici, orchestrated his assassination in 1537 while Alessandro was only in his late 20s.